I finished reading A Dark and Twisted Tide, the 4th in the Lacey Flint series, at the end of September, but never got round to writing about it, so now this is just a mini review. This is such a terrifying novel, particularly if like me, you have a fear of drowning. No longer a detective, Lacey is now a police constable with the Metropolitan Police’s Marine Unit on the River Thames, living on a houseboat (actually a vintage sailing yacht) in Deptford Creek and wanting a quieter and safer life whilst trying to recover from the terrifying events of her last cases. Unlike me, Lacey loves swimming and is perfectly at home in water, so much so that she wild-swims in the Thames as often as tide and conditions allow, loving it so much that she feels she has become part of the river. But even she experiences the terror of being drawn down into the water ‘within a frantic gasp of drowning‘. A Dark and Twisted Tide is a multi-layered book, told from different characters’ perspectives, complex and chilling as it weaves its way through murders, people trafficking, a mysterious character called ‘the swimmer’, more details about Lacey’s background and the ongoing saga of her relationship with Mark Joesbury. It’s a grim tale with a great sense of foreboding and mystery – a book I read far too quickly, making me think at some point I’ll read it again more slowly as I’m sure there’s a lot I missed. An excellent read for RIP X! Ooooh, I do like the sound of this 4th. instalment of this series. I have book one on my library pile and will be reading it soon, looking forward to getting to this one though! Cath you have a treat in store – I hope you like these books as much as I do. Thanks,Kim – Blood Harvest is one of my favourite books by Sharon Bolton and the Lacey Flint books are very good – I hope you enjoy them. 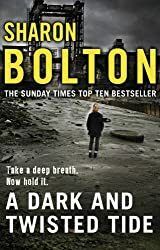 I recently read ‘Little Black Lies’, Bolton’s latest book. I wasn’t certain how I wold get on with it as it is a standalone novel and I do love a series. However, it is superb and I would really recommend it when you have the time to get round to it. So glad you enjoyed this, Margaret. I think Bolton’s a very skilled writer, and her Lacey Flint series is nicely done. Sounds like a super chilling read for R.I.P! I enjoyed this book though have since read Little Black Lies which I VERY much enjoyed!